I was under the impression that Batman: Gotham Knight "bridges the gap" between Batman Begins and The Dark Knight, but this DVD seems to me to be pretty non-essential viewing. You don't learn a whole lot besides some stuff about Boss Maroni and the Russians' mob war in Gotham, and the introduction of a minor cop character in Dark Knight. I tend to doubt Deadshot and Killer Croc will be referenced in The Dark Knight so I question whether these cartoons are even going to be canon. I'll guess we'll see on Friday. The six main chapters were extremely underwhelming. Some of the animation was nice. Some. But six different anime styles created a very disjointed viewing experience. I thought the Killer Croc and Deadshot chapters were generally the most successful, but I didn't think the writing was so hot, despite the hype of David Goyer and other big name writers penning the chapters. The voice acting is in the DC cartoon style of the last 15 years; monotone voice over work that puts me right to sleep. Overall though, compared to The Animatrix, which is the template Gotham Knight seems to want to follow, it's a failure. The Animatrix contained a riveting two parter explaining how the Machines gained control over the Earth and built the Matrix, and there was a very good, moody piece about how Neo freed The Kid's mind from the Matrix. Gotham Knight sums up as six fairly interesting, somewhat weird, but ultimately unconvincing vignettes about Batman. 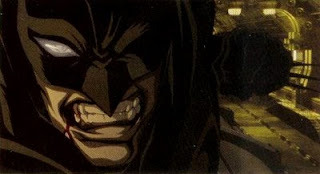 It's set in the Batman Begins/Dark Knight universe but doesn't really represent it well at all, since Chistopher Nolan's Batman movie universe is about grounded, gritty realism, which Japanese anime is pretty much the exact opposite of.